Part of the appeal of succulent plants is their versatility. You can do a lot with them. 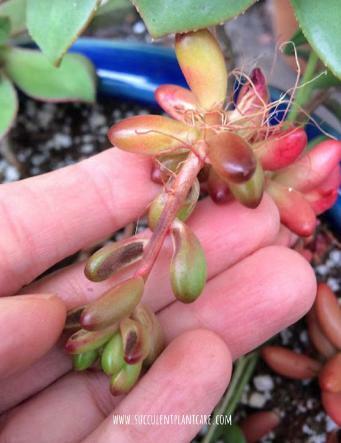 A single type of succulent plant can look totally different under different growing conditions. Some succulents grow really long and leggy. How can you tell if this is a problem and you need to take immediate action or it’s just the plant doing its thing and you could leave it alone? Here’s what I’ve learned from these amazing plants. 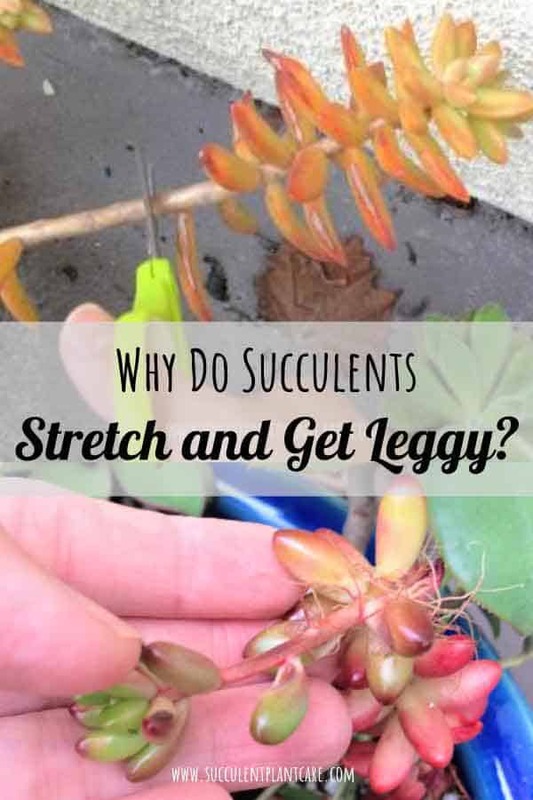 Why do succulents stretch and get leggy in the first place? Succulents need a certain amount of light to grow properly. If they are not receiving adequate sunlight throughout the day, you will notice them stretch and become leggy. This can happen within a few short weeks of the plant not receiving enough light to grow. It looks as if the plant is reaching out and looking for more light, which is literally what it’s doing. Does This Only Happen To Indoor Succulents? 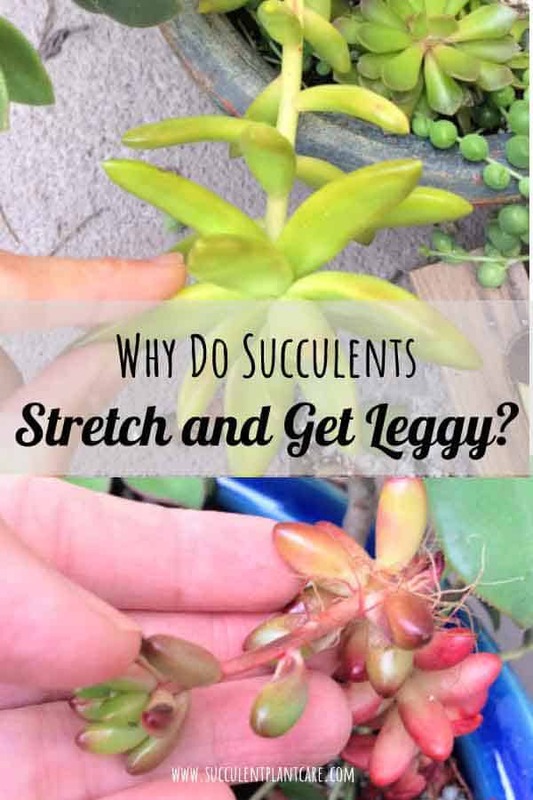 Succulents stretch and become leggy when they do not receive enough light, and this can happen indoors or outdoors. As long as the plant is not receiving enough light, it will stretch eventually. A plant grown outside but in the shade or shielded by other taller plants will still stretch. Growing succulents indoors can sometimes be trickier because the sunlight that comes through a window is not as strong as it is outside, and the intensity of the light gets weaker the further away the plant is from the light source. 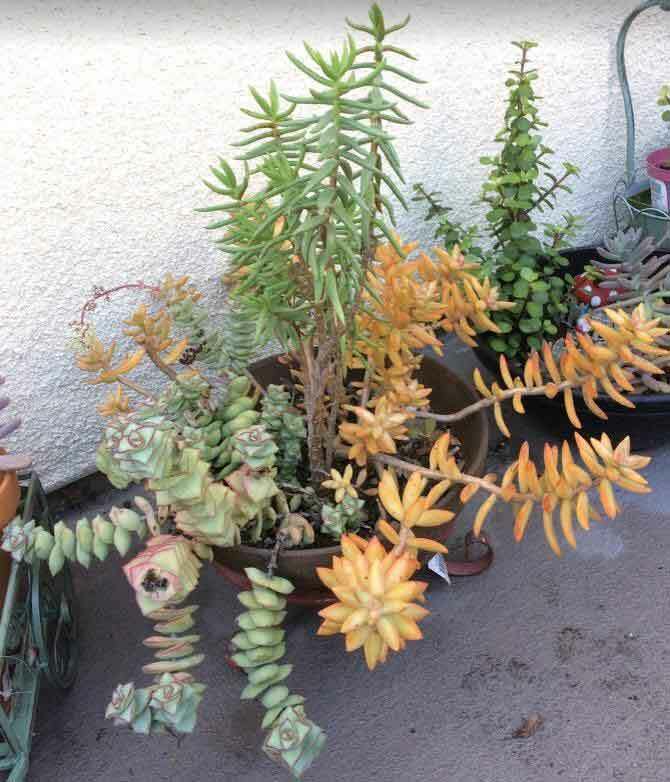 Roughly, succulents need a minimum of 4-6 hours of sunlight a day to grow and thrive. However, some succulents grow leggy even if they are receiving plenty of sunlight. So not all succulents get leggy from lack of light. Some succulents, no matter what you do, will grow leggy. It’s just their nature. Whether you want to do something about it or not is totally up to you. So how can we tell the difference? 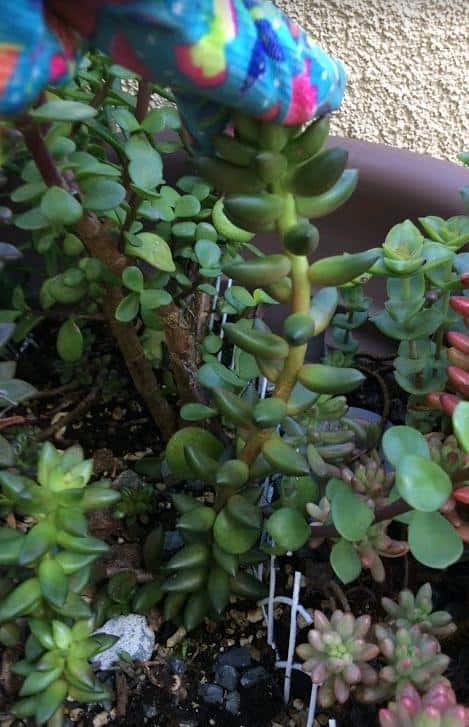 A succulent that is stretching for more light will have a weak stem. The stem will be soft and bendy. The plant will appear lighter in color or will lose the intensity of its colors and will have a general ‘stretched’ appearance. This whole process is called etiolation. The dictionary definition of etiolate is: to make something, especially a plant become pale and weak; make weak by stunting the growth or development of; a plant developed without chlorophyll by being deprived of light. On the other hand, a plant that naturally gets leggy overtime will not have a stretched-out look and will not appear pale. Its colors will remain vibrant and the stems, though leggy, will be able to support the plant. The plant will usually just have long, leggy stems that sprawl out as they grow. Graptosedum ‘Francesco Baldi’ naturally get leggy and grow long stems even in full sun. At first I was concerned about the leggy stems and trimmed the plant a lot. Now I enjoy how it looks cascading down the side of the pot. Graptopetalum ‘Copper Rose’ naturally get leggy as they grow and mature, even in full sun. Sedum nussbaumerianum ‘Coppertone Stonecrop’ and Crassula Perforata ‘String of Buttons’ naturally get leggy and trail as they grow and mature. What To Do When You Notice Your Plant Stretching and Getting Leggy? Determine whether the plant is getting leggy from lack of sunlight. If lack of sunlight is the reason, the first thing you need to do is to provide more light. Move the plant to a brighter, sunnier location. If doing so outdoors, take care not to burn your plant. You can increase the amount of sunlight it receives gradually. If your plant was in the shade, do not place it in full sun right away because it will get sunburned. Slowly increase the amount of light it receives until it is acclimated to the more intense sun. I acclimate my plants to more intense sunlight by providing morning sun first, which is less intense than afternoon sun. For plants that are in locations where afternoon sun is intense, I place them next to taller plants so they can be shielded from the intense heat. For indoor plants that are etiolated, find a brighter window or spot that receives more light. If moving is not possible or if it is already at the brightest spot in the house, consider giving the plant some outdoor time to get more sunlight. Outdoor sun is more intense and will give the plant the needed sun that it was searching for. If moving the plant outdoors is not possible, consider investing on a grow light to help supplement the lighting requirements of your plant. Here are some of my grow light recommendations. Once you increase the amount of light, the plant will slowly recover and will correct its growth. The ‘stretched-out look’ will not disappear overnight. It may take a while for your plant to start looking normal again. You have a choice whether you want to leave the plant alone or cut it to repot and propagate. If the plant gets leggy just because it naturally grows that way, you also have a choice whether to trim it or to leave it alone. It is more of an aesthetic reason than anything else and the plant will be fine either way. Trimming leggy plants is the quickest solution to fix the stretched look of the plant. 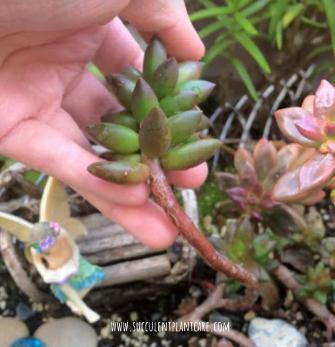 It is not only easy to cut a succulent plant that has become leggy, but it is also a great way to propagate your plants and multiply your collection. When cut, the base of the plant where cuttings were taken from will usually continue to grow and produce baby plants along the stem and the sides of the plant. Cut the plant leaving about an inch or so of stem on the bottom of the plant. Once the cut has healed, stick the cuttings in a well draining potting mix. I like to use cactus mix combined with perlite (1:1 solution). Here’s where you can find soil and soil amendments. Mist or water the soil every few days or when the soil feels dry. The stem cuttings will root in about 2 weeks, sometimes longer. Keep away from direct sunlight and continue watering every few days or when the soil feels dry. Increase sunlight and decrease watering when the plant matures. The base of the plant where the cuttings were taken from will continue to grow and produce new growth. On rare occasions, the base will stop growing and will die out. But hopefully you would have produced new plants from the stem cuttings if this happens. Find a spot to cut the plant. Ideally you want to have at least half an inch of stem on the bottom of the plant you are cutting so you can easily stick it in soil and propagate. When you see roots growing, try to get as much of the roots when you cut the plant. These will do really well when repotted in soil because they already have roots growing. 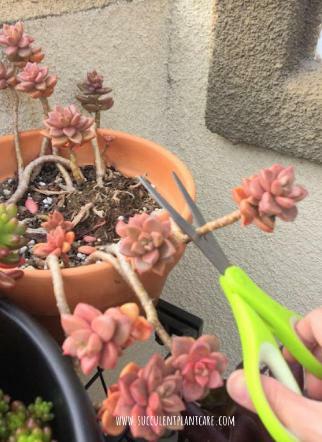 Do You Have To Cut Leggy Succulents? 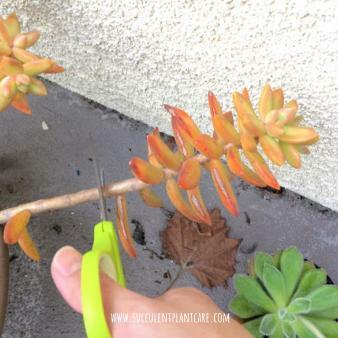 No, cutting is not necessary but provides a quick and easy way to improve how the plant looks. Cutting a leggy plant will also provide you with more plants and is a good way to multiply your plants. But if you decide to leave the leggy plant alone, it will eventually do its own thing and you’ll see some interesting things you didn’t know your plant could do. Succulents are really fascinating plant and they continue to amaze me with their resilience and hardiness. For instance, I had this Sedeveria ‘Jet Beads’ in a fairy garden growing really leggy from lack of sunlight because it was being blocked by taller plants. I removed the taller plants to give this plant more sunlight. I left the plant alone and overtime, the top part of the plant landed on soil because the stem was too weak to support it. The top part of the plant that landed on soil rooted and established itself as a new plant. This once leggy plant is now growing in two directions and transformed itself into two plants on its own. I’ve seen some plants that have become leggy produce new growth or baby plants along the stretched stems overtime. The new growth will eventually fill in the spaces where the plant has stretched. It may take a while longer, but if you don’t cut your leggy plant, it will do its job of eventually producing new growth. This just shows you the resilience of succulent plants. If left on their own to survive, they will find a way. These Sedeveria ‘Jet Beads’ started etiolating from lack of sunlight because it was being covered by taller plants in this planter. I removed the taller plants to give these plants more sun. I didn’t trim the plant and left it alone. A few weeks/months later I noticed the top of the plant landed on soil and is now rooted and growing. Sedeveria ‘Jet Beads’ top landed on soil because the stem became too leggy and couldn’t support the plant. The top of the plant that landed in soil rooted and is now growing upright. How do you keep succulents from getting leggy? Make sure they are receiving adequate sunlight, whether indoors or outdoors. Ideally, 4-6 hours of continuous light throughout the day is desired. Indoor succulents are more likely to get leggy. Place them near the brightest window of the house. Move the plant if necessary to a brighter location and if possible, provide some outdoor time for the plant. Consider using a grow light to supplement the plant’s lighting requirements. Make sure they are not being blocked by taller plants in a planter. Like what happened to my plant above, the planter was outdoors receiving full sun but the plant was being blocked by taller plants. Ideally, you want to plan ahead when potting your plants to know which ones would be better suited to go with which plants. But even if you don’t do that, it is a simple enough fix. Just pull out the plant from the planter (either the tall plant or the stretched plant, or both) and repot in a different planter. 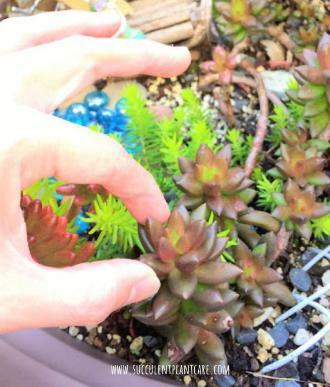 See how I did that in this post “Revamping an Overgrown Succulent Fairy Garden”. Rotate the pot so all the plants in the planter get adequate sunlight. Depending on where your pot is placed and how the sun hits the plants, you may need to rotate your pot from time to time to make sure all of the plants are getting enough sun. I have a planter that receives plenty of morning sun but the sun hits the pot at an angle so that the plants behind do not get as much sun and are starting to stretch. A quick solution is to rotate the pot every now and then so all the plants get some sun. 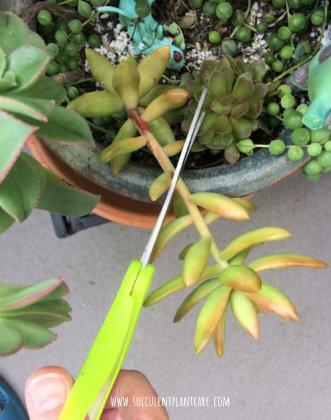 Do not overfeed or fertilize your succulents. 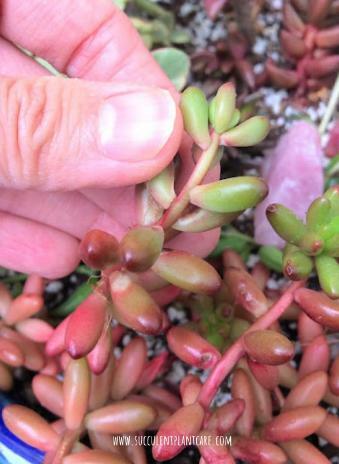 Succulents are not heavy feeders and if you fertilize more than the plant needs, the plant will stretch out and produce weaker growth. This is because the plant is growing too fast that it cannot support its own rate of growth. It is best to use ¼ to ½ strength of the recommended dosage on the label of fertilizer. Fertilize during the active growing season, which is in the spring to early fall for most succulents. Refrain from fertilizing during late fall to winter where growth usually slows down. 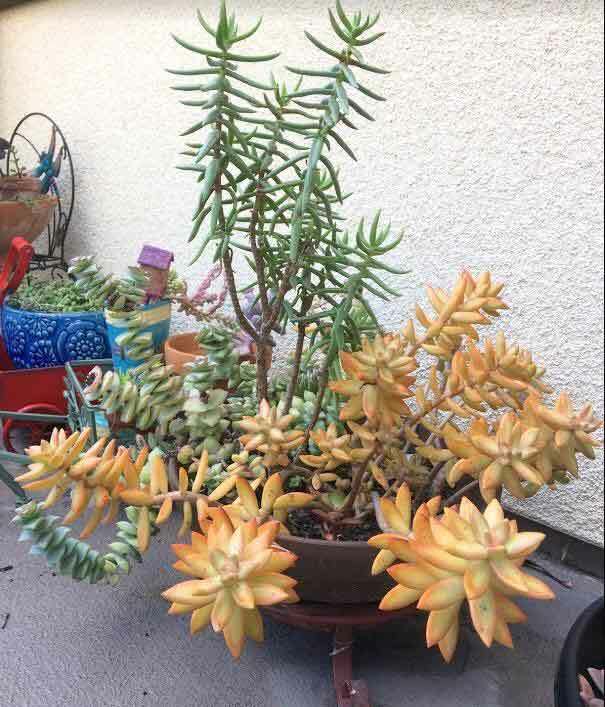 Sometimes leggy succulents are very appealing especially if they start cascading down the pot. A lot of succulents naturally grow this way and it’s part of their charm. 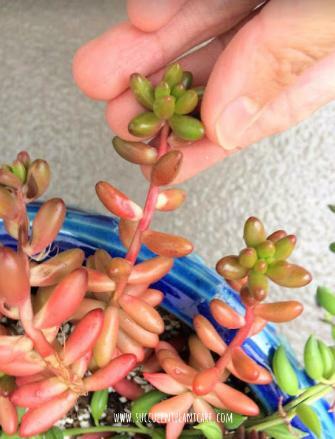 But if your succulents are getting leggy from lack of light, there usually is a simple fix for it and the plant will recover very quickly once the problem is corrected. 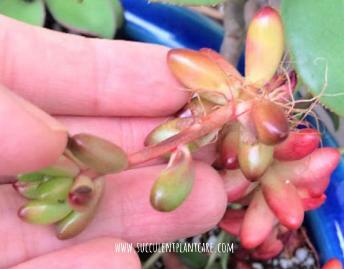 To read more about succulent problems and solutions, visit my other post “Common Problems With Succulents And How to Fix Them”. Check out my Resource Page to get some ideas where you can purchase succulents online. Pin this to save for yourself and share with others! 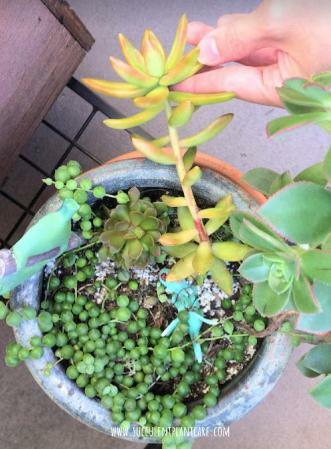 PreviousWhy Do Succulents Turn Red Or Change Colors?